You can now give your 1:1 Meetings a unique title. This makes it clear what the focus is when you’re preparing, or gives context when you’re looking back in retrospect. We’ve also added a filter option. Giving your meeting the title “Growth Goals Check in Q1” not only helps the other person understand what this meeting is about at a glance, but it’ll be incredibly simple to find it when the same check-in for Q2 is due: simply filter by title. 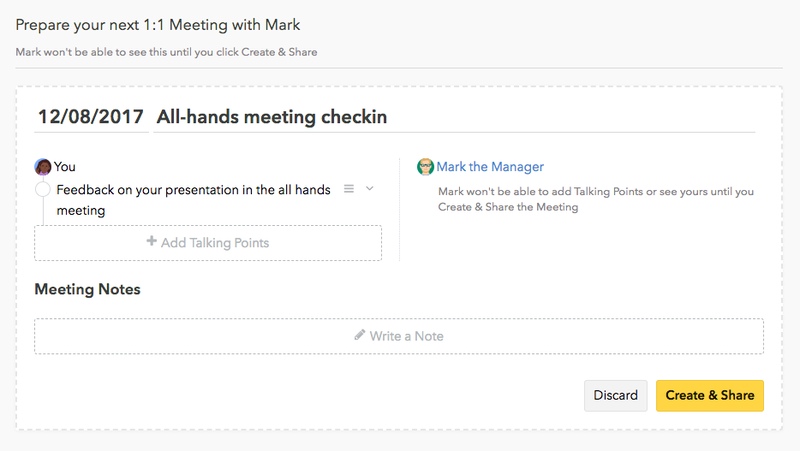 We added the ability to create a meeting but keep it private until you decide to share it. Previously, the other participant was notified the moment you created a meeting. Now, you can prepare all your talking points first and then share them with the other participant when you’re ready. Previously, if you had an uncompleted meeting, you couldn’t start a new one. We updated the workflow so you can more easily create, draft, and then share your planned 1:1s. Have any thoughts about our new functionality fixes? Got other thoughts about Small Improvements’ Performance Appraisal Software? We’d love to hear them. Get in touch by sending us an email to product@small-improvements.com or leave us a comment below.